Carefully crafted for iOS tab bars, toolbars, nav bars and table rows, Glyphish icons are also perfect for Android, Windows Mobile, websites, UI design, t-shirts, tattoos, stencils, stickers and much more. Every set includes @2x and @3x size icons for crisp rendering on Retina and high-resolution displays. Need larger sizes? Just grab the vector icon and scale it up, pixel-perfect for making your app look amazing on any platform and on any device. Glyphish works great with Android too; you can output any sizes you need from the included vector source files. Each icon is bundled as a PNG ready for dropping into Xcode, plus an SVG for use on the web, plus an overview PDF for reference. Each set also contains a master PSD and AI file with vector shape layers, perfect for working with designers, creating mockups or customizing icons. Icon sizes follow Apple guidelines for tab bars and toolbars. Beautiful outline icons with selected states make it easy to design a beautiful app, and the entire collection looks great in iOS however you choose to use them. Create any additional sizes you need with Photoshop files containing vector shape layers, so you can scale designs up and down by multiples of two and your icons remain crisp. It's the easy way to design for variable display size and pixel density. Add richness with colorful app background graphics in all high-resolution sizes required for iOS devices. Perfect anywhere a bit of extra visual style is needed. Available exclusively with the Glyphish bundle. Created by Joseph Wain. Follow @glyphish on Twitter to get updates and new icons. For questions, feedback, support or help with usage, or just to say hello, send a message. Free icon set published under a Creative Commons Attribution license: simply provide a note and a link back to the Glyphish website. Full sets do not require attribution and can be used in an unlimited number of projects. View license. Try 50 icons free. Attribution required. Includes 400 outline icons, with separate sizes for toolbars and tab bars. Includes 200 solid icons in an essential kit for your iOS 7 app. Includes 400 classic icons plus extra symbols and mini icons. Be the first to find out about new icons and get amazing developer resources delivered to your inbox. If you're interested in building beautiful apps, this is the news you need. No spam, no junk, only good stuff. Have an interesting icon idea? Need an icon that you just can't find? Request a new icon and include your Twitter handle to get a notification when it's created. Add a link to Glyphish or a graphic badge on your website, send in a note and get back some handy bonus icons as our way of saying thanks. Download badges. Get 2200+ icons in one amazing package. Includes Glyphish 3, 4, 5, 6, 7, 8, and 9, all in 1x, 2x and 3x sizes, in both PNG and SVG format, with Sketch source files included. See full previews of each set. The original great icons for iOS, used in more than 250,000 apps and loved by developers worldwide. Every icon comes in 1x, 2x and 3x sizes, in PNG and SVG format. For any app, website or creative project, Glyphish 3 is a great way to start. Sharp and pixel-perfect for making your design sparkle. 200 great icons designed for iOS as an alternative to thin outline icons, because solid icons are still very useful outside of tab bars and toolbars. Looks great in table rows and buttons. Works on Android and Windows Phone too. The best icons for mobile apps. Preview the entire set here. Includes separate sizes for toolbars and tab bars, plus filled-in selected states, and every icon in 1x, 2x and 3x sizes, PNG and SVG. Great outline icons Apple should have included with Xcode. With Glyphish 6, 7, 8 and 9 together, you'll have the icons for any kind of iOS design project. Perfect for iPhone, iPad, and Mac apps too. Requested by developers around the world. Perfect for any kind of design project. Great for iPhone, iPad, and Mac apps too. As a paying license holder, you're free to use the icons and artwork for commercial and non-commercial purposes, for yourself, your company and your clients, and to edit, remix and otherwise modify. You may not sell or redistribute the icons themselves as icons. The icons may not be used in any form of "easy app builder" tools or websites. Xcode is acceptable; point-and-click app creator websites are not. The icons may not be redistributed under any other license without expressed written permission. Yes! Tattoo them on your arm, use them on your business cards. Do not resell them as icons or use them in app builder tools or templates. If any questions, send a message. Since these are digital files, no refunds or exchanges will be granted after completed purchase and download. Additional downloads available upon request up to 60 days after purchase. Free sample icons are require attribution in the form of a note and a link back to the Glyphish website. For full sets, no attribution is required for use by you, your company, your clients. But if you'd like to spread the word by linking to Glyphish from your website, blogpost, Twitter or wherever, your kind words are much appreciated. Have a question about Glyphish? Send a message. Need custom icons or some exception to the licensing terms? Happy to discuss. Follow @glyphish on Twitter for updates and more. If you find Glyphish useful, support the creation of more icons by purchasing the complete set of a 2200 great icons, Retina support for everything, plus colorful app background graphics. Yes! Buy the bundle for $99 — no attribution required. 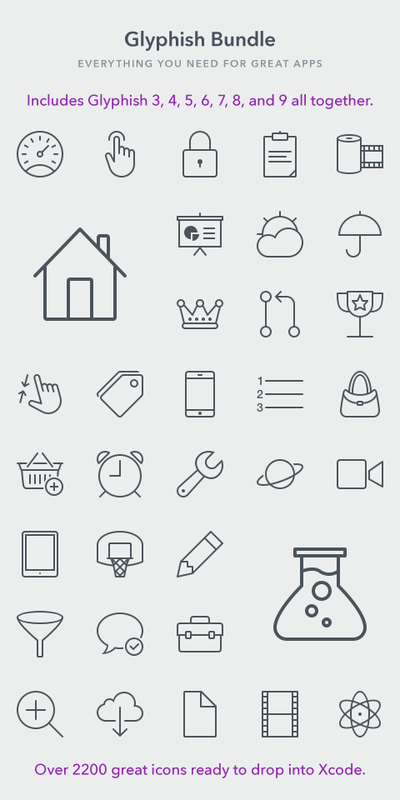 Try 50 free sample icons — requires that you link to the Glyphish website from your app's website or blog.